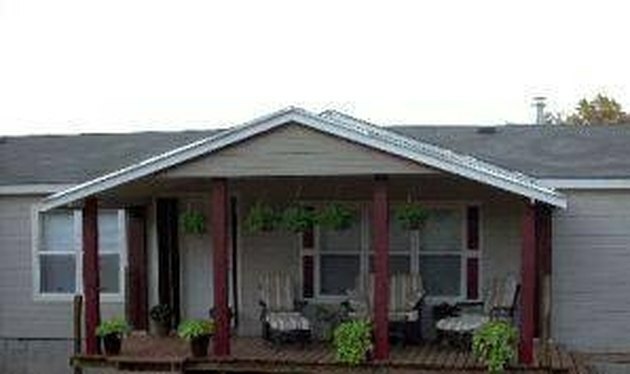 Building a gable roof over your existing deck will make it more comfortable, providing shade and shelter from the rain. The gable design of the roof will also allow for excellent rain and snow runoff in wet climates. Follow these steps to build one of these functional roofs yourself. Determine the locations for your roof support posts. Mark these locations on the deck and cutout areas in the deck at these spots to be able to dig a hole in the ground below the deck, set a concrete footing and attach the posts. Dig holes in the ground at each post location at least 18 inches in depth and 12-18 inches wide. Slide cylindrical concrete forms into the holes and fill with concrete. 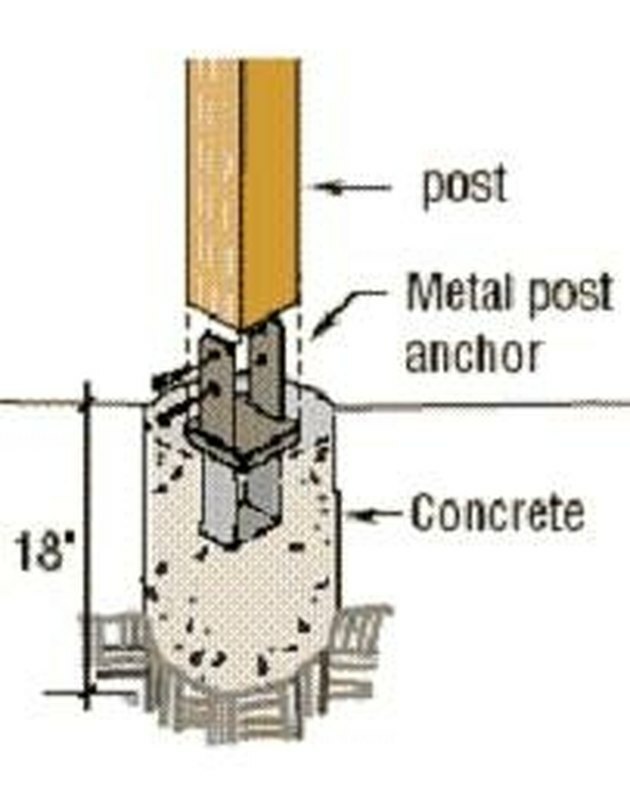 While the concrete is still wet, set and align post anchors in it. Allow concrete to cure for 24 hours. Measure and cut 6x6 support posts to size for your roof's dimensions. Set the support posts in the post anchors and attach loosely with the included nuts and bolts. Make sure the posts are plumb, temporarily brace them and tighten the nuts and bolts. Measure and cut two 2x8 pieces of lumber to a length that is the same as distance between the center of the support posts. Get help to hoist the 2x8s one at a time and temporarily nail one 2x8 to each side of the post in a manner that will allow the nails to be easily removed later. 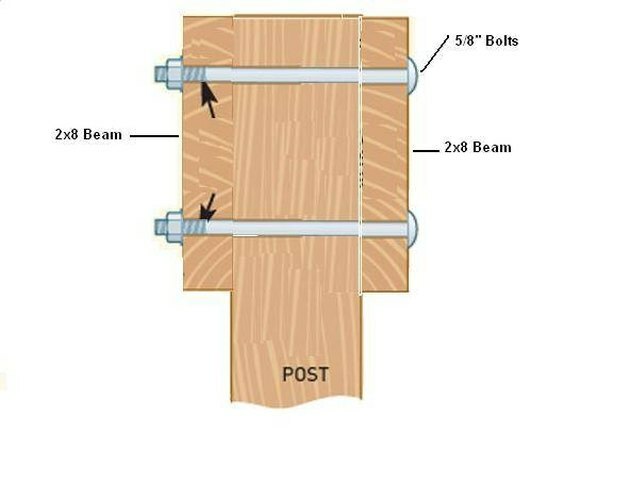 The 2x8 should be lined up with the center point of the post on each side and flush with the top of the post as shown in the diagram. Measure and mark locations for matching holes on both the support posts and beams to accommodate the 5/8-inch bolts. Remove the nails, lower the 2x8s, and drill the holes in both the posts and the 2x8s. Raise the 2x8s again and bolt securely into place. Repeat for all spans between support posts. Starting at one end of the shorter side of your roof, mark locations for roof trusses every 24 inches on center on the tops of the 2x8s. Get help, raise one of the end trusses to its position on the mark you made for it and nail into place. Temporarily brace and continue this process for all the roof trusses. Nail 5/8-inch plywood sheathing on the trusses for roof decking. Use roofing tacks to attach roofing felt to the sheathing, making sure to overlap it 3-4 inches at the edges. Install drip edge. Shingle the roof. Paint or stain the posts and beams and you're finished with your gable roof.